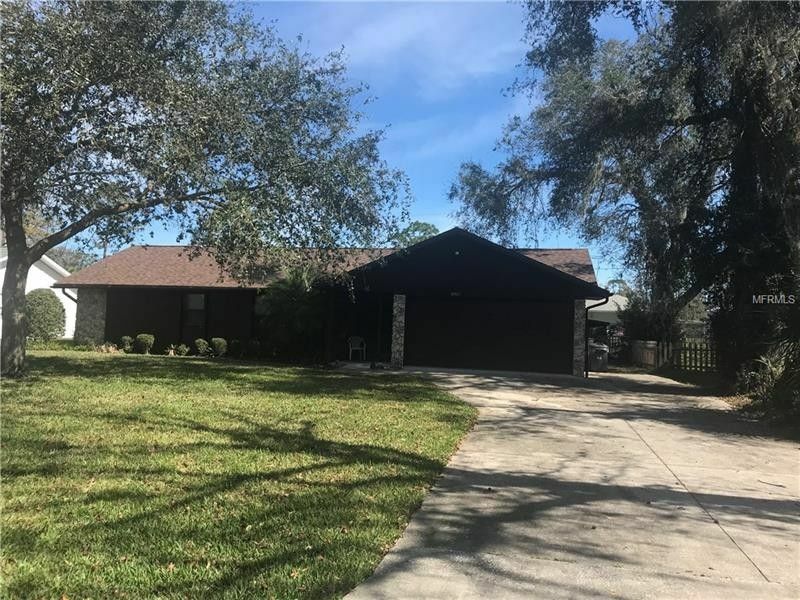 Three-bedroom, three full baths home in Florida Shores. Exterior of homes was painted in 2016 and new roof installed in May 2017. Double door entry with brand new screened door. Open concept with vaulted ceilings including wood beams in living room which opens to kitchen and dining area. Large picture window in living room to bring in a lot of natural light. Split plan with two of bedrooms offering private baths. All baths and kitchen have tiled floors. One bath has shower with pedestal sink. Guest bath has single sink with vanity, tub and shower. Third bath has single sink and shower along with private access to garage. AC and hot water heater are less than ten years old. New windows throughout entire home, wind rated grade. Sparkling, fiberglass pool with lots of decking and brand new screened in feature. Backyard completely fenced in with chain link. Gutters and sprinkler system with two zones on well. Flower beds are housed with soakers. Attic has area for more storage. Washer and dryer hook up in garage.